Since 1976 we have been working successfully in the medical field. The focus of all our measures and activities is the customer. His wishes, demands and requirements are a daily challenge for us. Therefore, customer service is our top priority. It effects our business policy and is a permanent task for every member of our team. For this reason we are prepared for the future at any time. 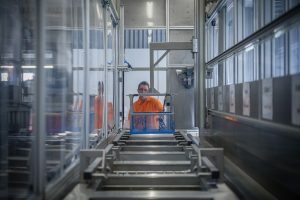 Our Quality Management is an essential component in our long-term company strategy in which every single employee is involved and which is supported by a common feeling. Every DIMEDA employee feels himself responsible for observance of quality no matter in which department he is working. 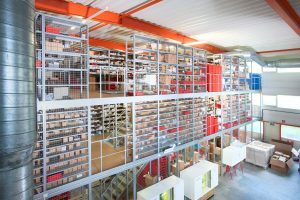 Our extensive warehouse guarantees quick delivery times. Articles which are not available ex stock can be supplied in a short time due to a special service. All instruments and devices of our product range are manufactured by well-trained and experienced skilled workers with special craftsmanship and by use of most modern machines and equipment. We only use materials which meet our high quality standards. Our product range with more than 23,000 different standard instruments for Human, Dental and Veterinary medical applications is permanently increased and optimized as per the state of the art by the close cooperation of our domestic and foreign customers, physicians and scientists. 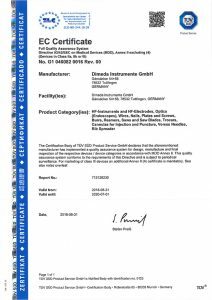 All DIMEDA products comply with the basic requirements of the EC Directive 93/42/EWG and have thus the CE mark. 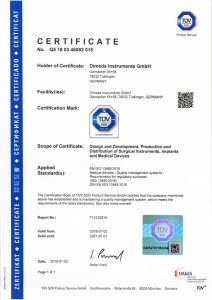 Our Quality Management System is certified according to DIN EN ISO 13485:2016. The compliance with international standards, like for instance those of the FDA, has the highest priority for us. Every single product has to pass several quality checks and thus is individually treated by hand. All instruments and devices of our product range are manufactured by well-trained and experienced skilled workers with special craftsmanship and by use of most modern machines and equipment. On this occasion we only use materials which meet our high quality standards. Since 40 years physicians and surgeons all over the world are using our surgical instruments. There is hardly a country where we do not have a distributor. It is often a long way before our goods reach their final destination from our stock. We do our utmost that your order arrives in time and to your entire satisfaction.